The Department of Electronics and Communication Engineering was started in the year 2003. 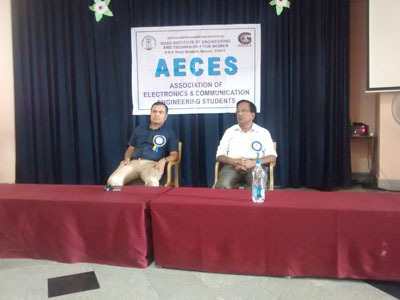 ECE course is a four years under-Graduate program in Bachelor of Engineering, affiliated to Visvesvaraya Technological University (VTU) , Belgaum, Approved by All India Council for Technical Education (AICTE), New Delhi. Initially the intake was 60 and was increased to 120 by the year 2011. The Department has 22 professionally qualified faculty members with various research specializations (Applied Electronics, VLSI Design and Embedded systems, Digital Electronics and Communication Systems, Computer Network Engineering, Industrial Electronics, Electronics, Embedded systems, Bio medical signal processing and instrumentation). The Department also comprises of experienced and skilled technical support staff. The student staff ratio has been maintained as per AICTE norms. 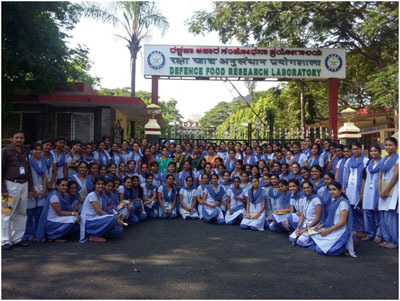 "To foster professional level competence in all areas of Electronics and Communication Engineering and to benchmark the Department as a centre for nurturing Women Engineers in the Country"
M1: To impart value based Technical education and training. M2: To impart Theoretical Knowledge, Practical Knowledge and Entrepreneurship Skills. M3: To develop Innovation and Creativity in Students. M4: To conduct Application oriented research. 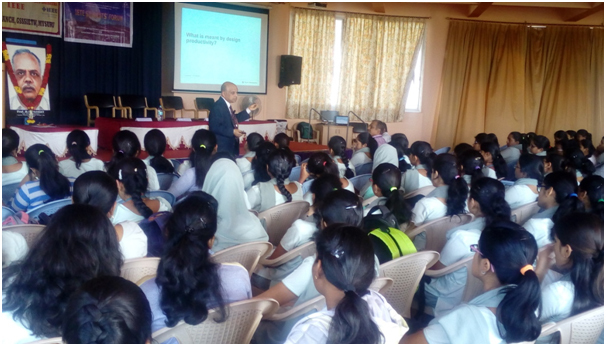 M5: To sensitize the Students regarding Social, Moral and Professional ethics. M6: To provide sufficient Industry exposure to the Students. M7: To provide special skills training to the Students to make them eligible for Placement. 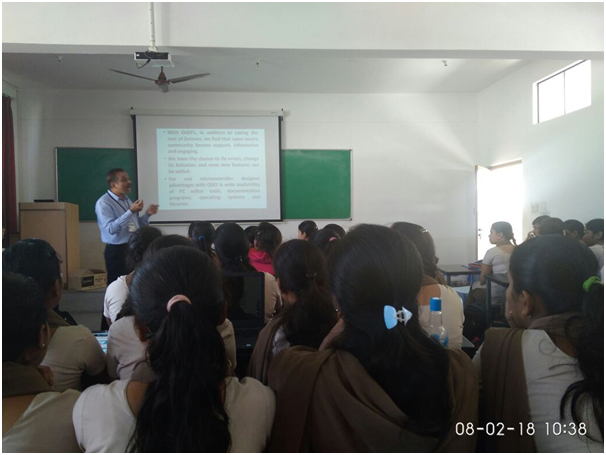 PEO1: To inculcate students to excel in professional career and/or higher education by acquiring knowledge in the field of Electronics and Communication. PEO2: To make the students capable of managing their profession based on existing as well as new emerging technologies in the area of Electronics and Communication Engineering. PEO3: To Produce Technically competent graduates with ability to analyze, design, develop, optimize and implement Electronics and Communication systems. PEO4: To prepare the students to be able to exhibit professionalism, ethical attitude, communication skills, team work in their profession and to adapt to current trends by engaging in life-long learning. PSO1. Graduates will have the ability to mould the technology in the areas of Analog and Digital Scenario. PSO2. Implementation of functional Blocks of hardware software co-design for signal processing and communication application. Electronicssubjects like Fundamentals of CMOS VLSI Design, Fundamentals of HDL programming, Network Analysis, Field Theory, Analog Electronics circuits, and etc. 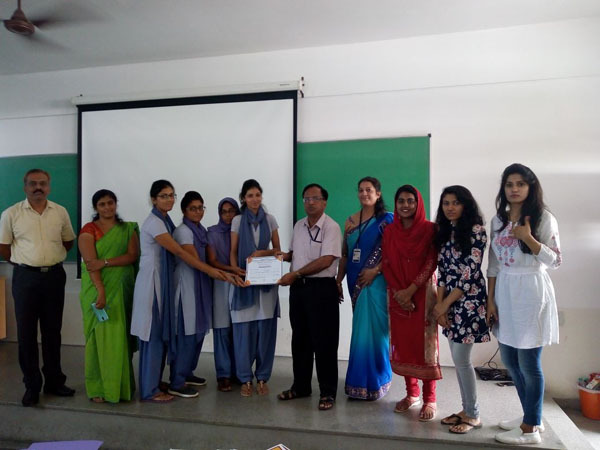 Signal Processing & Communication subjects like Signals and Systems, Digital Signal Processing, Speech Processing, Image Processing, Analog Communication, Digital communication, and etc. Computer science subjects like operating systems, Programming in C++, and etc. Management subjects like Management and entrepreneurship, and etc. Mathematics subjects like Mathematics III, Mathematics IV, and etc. PE Lab introduces Power Semiconductor devices, measurement of operating characteristics of power electronic circuits and control hardware for various power and energy applications such as motor drives. The Equipments: CRO– 5 Nos, Power Modules– 30 Nos, Components: SCR, TRIAC, DIAC, Isolation Step-up and step down transformer, are used to carry out the University Lab Experiments: Rectifiers, Speed Controllers, Choppers, Inverters etc. Digital Electronics Design Lab is a platform to learn digital logic and design various digital circuits. The Equipments: Digital Trainer Kits - 21 Nos, are used to the carry out university lab experiments: Combinational logic circuits (Adders, Subtractors, Multiplexers, Encoders &amp; Decoders) Sequential logic circuits (Registers, Counters, Sequence Generator). Microprocessor lab is designed to understand the internal organization of INTEL 8086 Microprocessor, and to enhance assembly level language programming and debugging skills. AE Lab explores the design and construction of Analog Electronic Circuits. The major equipments: CRO - 18 Nos, Signal Generator - 19 Nos, Regulated Power Supply – 12 Nos, and Components: Diodes, Transistors, FET’s, LIC’s, Transformers, Crystals, etc are used to carry out the University Lab Experiments: Amplifiers, Rectifiers, Oscillators, Clippers & Clampers. LIC+AC Lab explores the design and construction of Analog Electronic Circuits. The Equipments – CRO – 2 Nos, Microprocessor Kits – 3 Nos, I/O Card – 20 Nos & Interfacing Boards – 10 Nos and Softwares - MASM are used to carry out the University Lab Experiments - Data Transfer, Arithmetic & Logic, Bit Manipulation, Serial Communication, ADC, motor control etc. Communication Lab enables to formulate and interpret the processing of signals in communication systems by designing, measuring and evaluating the circuits using laboratory instruments. ADC Lab deals with the latest communication techniques like Optical Fiber and Microwave Communication. The Equipments: CRO – 7 Nos, DSO – 6 Nos, Signal Generator – 24 Nos and Communication Kits – 12 Nos and components: LICs, Transistors, Diodes etc used to carry out the University Lab Experiments: Filters, Analog & Digital Modulation Techniques, Op-amp Applications, Optical Fiber Communication & Microwave Communications. VLSI Lab provides hands-on design and simulation of basic building blocks of digital integrated circuits using EDA tools and technologies. DSP lab introduces implementation of algorithms in DSP design and analysis techniques using Silab. on 05/04/2018, as a part of Digital Communication (15EC61) tutorial class. 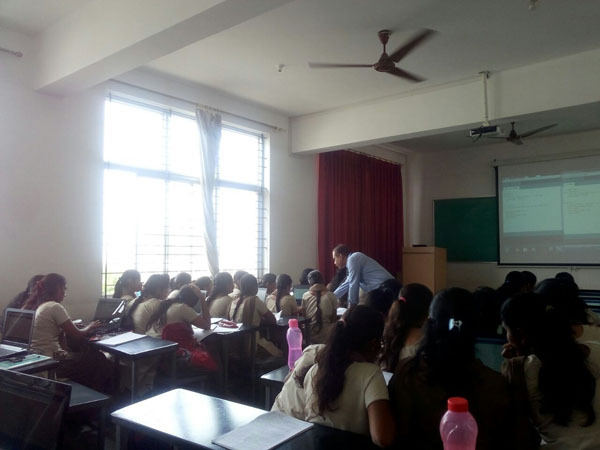 Class Room supported with LCD Projector with White Screen for projection and Glass Board. Tutorial Room supported with White Board. The Department Library is well stocked with books and Project Reports. It has 450 books, 110 titles and 179 project reports for the benefit of the students and Staff with issue facility. Prashanth B.S, Dip (E&C), Foreman. 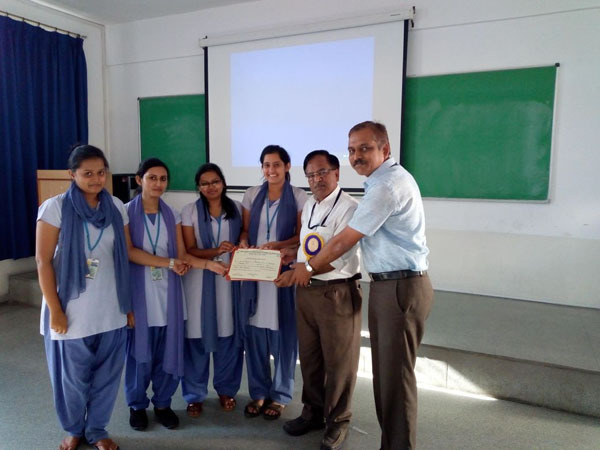 [From Left]: Swathi Gupta, Sajna Nanjappa, VII Sem Students, ECE Department,Sri R.K.Bharath, CEO and Management Committee member GSSS(R),Dr .M.Shivakumar, Principal, GSSSIETW Mysuru, Mr. Narasimha Kumar, Chief Technology Officer, KrutiBimb concepts, Bengaluru, Mr. Naveen Rabakavi, Principal Researcher, KrutiBimb concepts, Bengaluru, Mr. Muthukumaraswamy D P K, Chief Executive Officer, KrutiBimb concepts, Bengaluru, Dr. Rajendra R. Patil, Professor & Head, Dept of ECE, Dr. S.Padmashree, Professor, Dept of ECE, Smt. Sushma.S.J, Associate professor, Dept of ECE , Dr Jayanth .J, Associate professor, GSSSIETW, Mysuru. 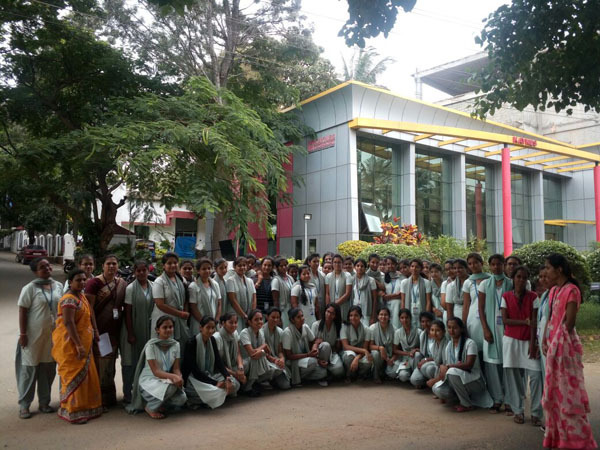 A Memorandum of Understanding (MoU) was formally signed recently between GSSS Institute of Engineering and Technology for Women (GSSSIETW), Mysuru and KrutiBimb Concepts, Bengaluru to bridge the gap between Industry and Institution at GSSSIETW, Mysuru. KrutiBimb Concepts intends to play a critical role in crafting the future of advanced engineering systems, leveraging their extensive experience in systems engineering. Driven by innovation as the central theme, at KrutiBimb creates products with highly positive social impact. By signing this MOU, GSSSIETW and KrutiBimb Concepts, have agreed to enhance the quality of the research output of the Faculty, Doctoral Students, Post graduate students and Under graduate Students of the Institute, both at institution and at KrutiBimb Campuses. Faculty members and students of the institution can participate in the R&D activities of the KrutiBimb personnel from KrutiBimb will visit the institution to advice the students regarding projects and to organize workshop and seminars in the institution campus for the benefit of faculty members/ students. The MOU was signed by Dr. M. Shivakumar, Principal, GSSSIETW and Mr. Narasimha Kumar, Chief Technical Officier KrutiBimb Concepts, Sri. R.K Bharath, CEO GSSSIETW and Management Committee Member, GSSS(R), Sri. Muthukumaraswamy D P K, CEO, KrutiBimb Concepts, Sri. Naveen Rabakavi, Principal Researcher, KrutiBimb Concepts,Dr. Rajendra R Patil, Professor and Head (E & C), Dr. S. Padmashree, Professor, Dr. Jayanth. 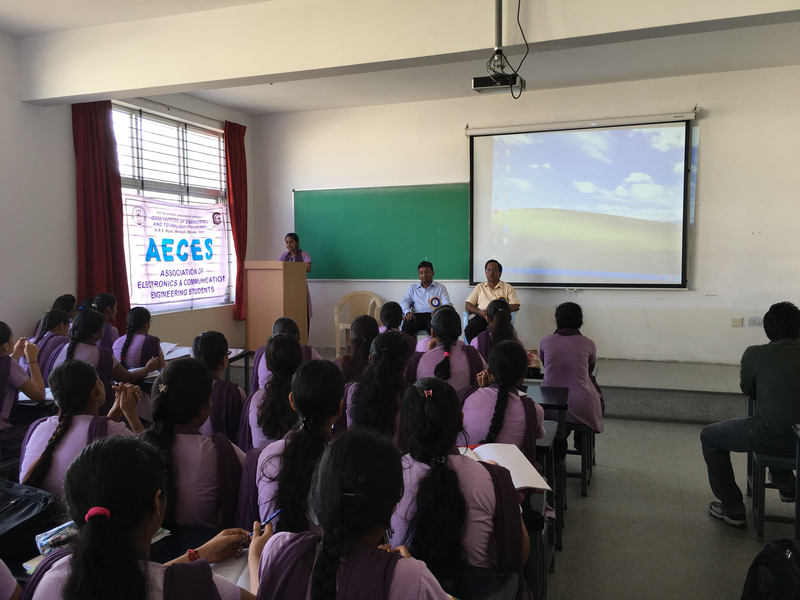 J, Associate Professor and Mrs. Sushma S J, Associate Professor from Dept of ECE were present on the occasion. Memorandum of Understanding (MoU) was formally signed on 3rd May 2018 between GSSS Institute of Engineering and Technology for Women (GSSSIETW), Mysuru and Advanced Electronics Systems, Bengaluru. The signatories of the MoU were Dr. M. Shivakumar, Principal, GSSSIETW and Sri. Sunil Shambhatnavar, General Manager, ALS in the presence of Sri R K Bharath, CEO and Management Committee Member, Dr M V Sathyanarayana, Professor and Head, ECE Dept. 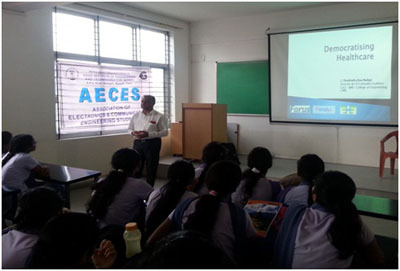 Dr. Rajendra R Patil, Professor, Dr. Padmashree S Professor and Dr. Jayanth J, Associate Professor of ECE Department. 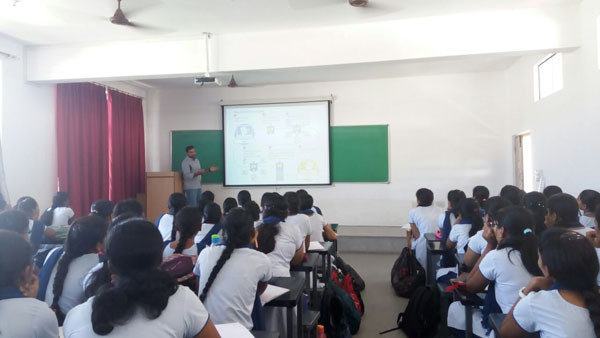 Conduction of training programs (with hands on sessions) using latest tools and hardware kits in the area of Embedded and VLSI Systems. To provide Internship for UG and PG students. To assist UG and PG students in placements. 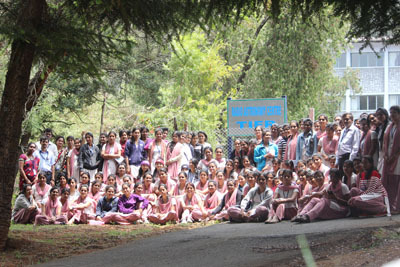 Organize Industrial Visits to UG and PG students. Provide resource persons/ key speakers in the area of Embedded and VLSI Systems. The Projects designed with supporting tools will be submitted to the college with a Vision to setup a project lab in the Department of Electronics and Communication Engineering. 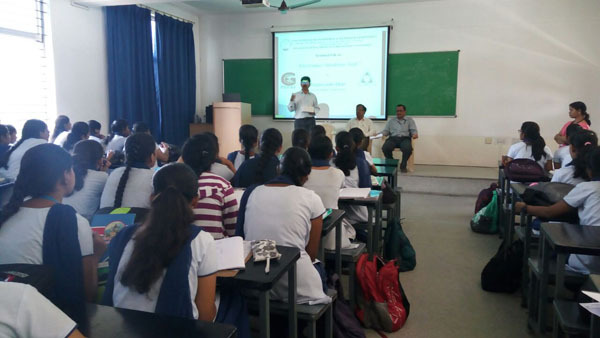 A Memorandum of Understanding (MoU) was formally signed recently between GSSS Institute of Engineering and Technology for Women (GSSSIETW), Mysuru and kaaya Tech Inc., Mysuru to bridge the gap between Industry and Institution at GSSSIETW, Mysuru. The MoU is intended for technical cooperation between the kaaya Tech Inc., Mysuru and the Department of ECE, GSSIETW and focus their efforts on cooperation within the area of Skill Based Training, Education and Research. By signing this MOU, GSSSIETW and kaaya Tech Inc., have agreed to jointly organize Faculty training programs, internship programs, job placements and guest lecture’s for students in order to bridge the skill gap and make them industry ready, through workshops and final year projects. 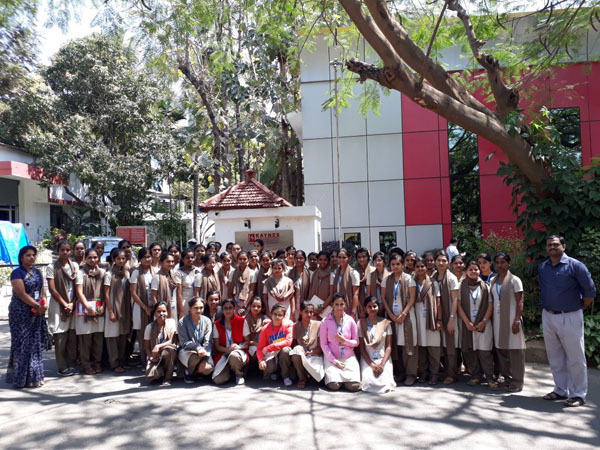 A Memorandum of Understanding (MoU) was formally signed recently between GSSS Institute of Engineering and Technology For Women (GSSSIETW), Mysuru and Kaynes Technology, Mysuru. 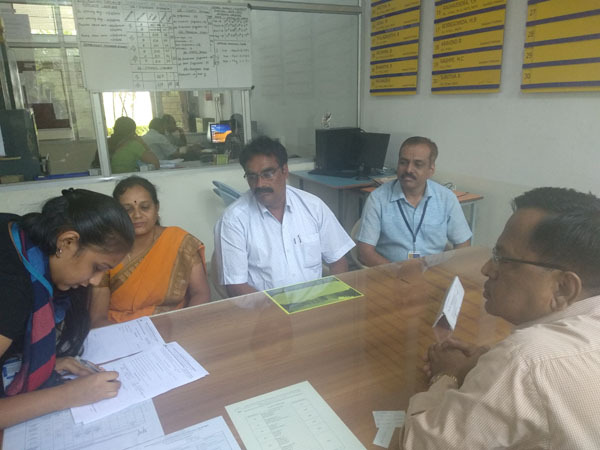 Intended for technical cooperation between the Kaynes Technology and the Departments of TE and ECE, the MOU was signed by Dr. M Shivakumar Principal, GSSSIETW and Mr. P V Harish Sundar, Business Head- Embedded Design Services, Kaynes Technology, Mysuru. Sri. R.K Bharath, CEO, Dr. M V Sathyanarayana, HOD, Dept. of ECE, Dr. Parameshachari B D, HOD, Dept. of TCE were present on the occasion. [From Left] Dr Rajendra R Patil, Professor, ECE, Dr. M. V. Sathyanarayana, Professor & Head, Dept. of ECE, Sri. R.K Bharath, CEO and Management Committee Member GSSS(R), Dr. M Shivakumar , Principal, GSSSIETW, Mr. P V Harish Sundar, Business Head- Embedded Design Services, Kaynes Technology, Mysuru. Dr.Parameshachari B D, Professor & Head, Dept. 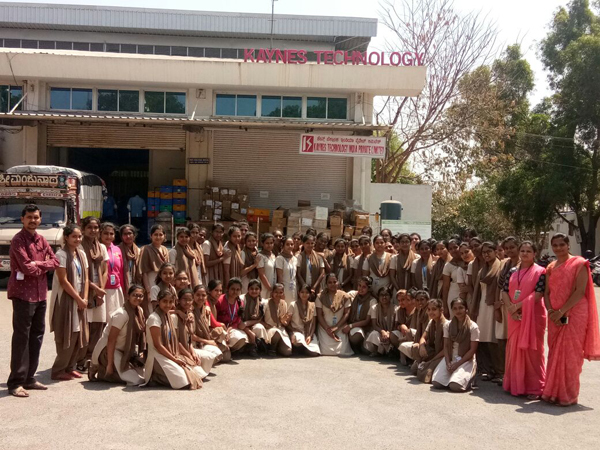 of TCE, GSSSIETW, Dr. S Padmashree,Professor,ECE, Mrs Latha M, Assistant Professor, TCE, Mr. Senthil Kumar,Design Engineer, Kaynes Technology, Mysuru Mr. Saravanan Vikram, Project Manager, Kaynes Technology, Mysuru. 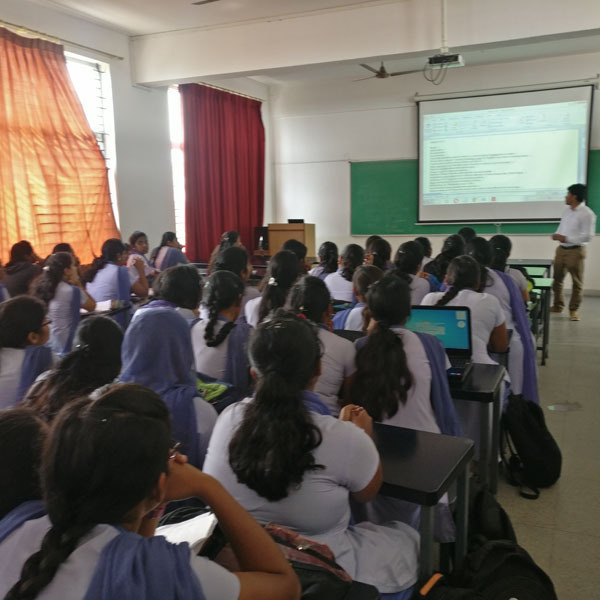 A Memorandum of Understanding (MoU) was formally signed between GSSS Institute of Engineering and Technology for Women (GSSSIETW), Mysuru and Digital Shark Technologies Pvt. Ltd. Bengaluru, organized by the Department of Telecommunication Engineering and Department of Electronics & communication engineering on 10th November 2016. To provide resource persons to conduct workshops, technical talk, conferences and training programs (with hands on session). A Memorandum of Understanding (MoU) was formally signed on 2nd of November 2015 between GSSS Institute of Engineering and Technology for Women (GSSSIETW), Mysuru and Applied Cognition Systems Pvt Ltd, Bengaluru. The signatories of the MoU were Dr. Sumithra Devi K A, Principal, GSSSIETW, Dr M V Sathyanarayana, Advisor(PG studies and Research), Professor and Head , ECE Dept., GSSSIETW and Dr P S RamKumar, Founder and director ,Applied Cognition Systems Pvt Ltd in the presence of Smt.Vanaja B Pandit, Hon. Secretary, GSSS(R) and Sri O.Prathap Kumar, Joint Secretary, GSSS(R). Sri R K Bharath, CEO and Management Committee Member, GSSS(R); Smt.Anupama B Pandit, AAO, GSSSIETW; Sri. B K Nataraj, Member, GSSS(R) and Sri.Ashok Shenoi, Member, GSSS(R) graced the occasion. 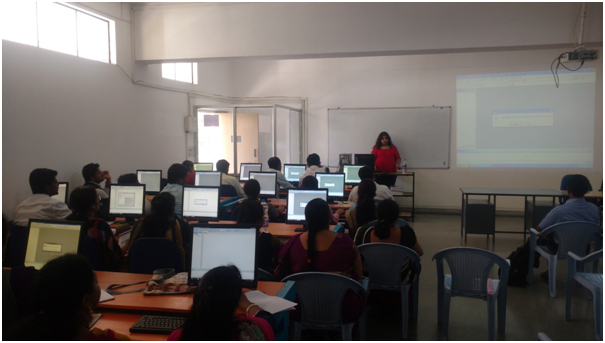 Technology Training for students and faculty members of GSSSIETW. Academic projects for UG and PG students. Collaboration in R & D activities. A Memorandum of Understanding (MoU) was formally signed on 29th of September 2015 between GSSS Institute of Engineering and Technology for Women (GSSSIETW), Mysuru and Advanced Electronics Systems, Bengaluru. The signatories of the MoU were Dr. Sumithra Devi K A, Principal, GSSSIETW and Sri Sunil Shambhatnavar, General Manager, ALS in the presence of Smt. Vanaja B Pandit, Hon. Secretary, GSSS(R) and Sri O.Prathap Kumar, Joint Secretary, GSSS(R). Sri R K Bharath, CEO and Management Committee Member, GSSS(R); Smt. 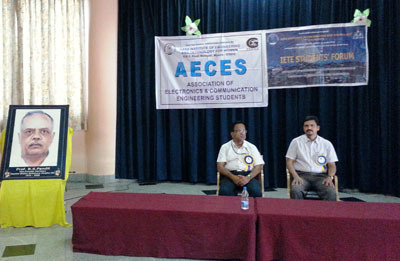 Anupama B Pandit, AAO, GSSSIETW; Dr M V Sathyanarayana, Professor and Head , ECE Dept. and Dr Parmeshachari B D, Assoc. Professor and Head , TE Dept. graced the occasion. The college houses an INTEL Lab. INTEL® Intelligent Systems Lab has been setup to enhance students' employability skills by signing Memorandum of Understanding (MoU) with Intel®-FICE (Foundation for Innovation and Collaborative Education) in order to bridge the gap between industry and academia. FICE is also committed to support in assisting students for the academic projects by providing training and certification thereby generating employment. The Department houses an INTEL Lab. INTEL® Intelligent Systems Lab has been setup to enhance students' employability skills by signing MoU with Intel®- FICE (Foundation for Innovation and Collaborative Education) in order to bridge the gap between industry and academia. FICE is also committed to support in assisting students for the academic projects by providing training and certification thereby generating employment. 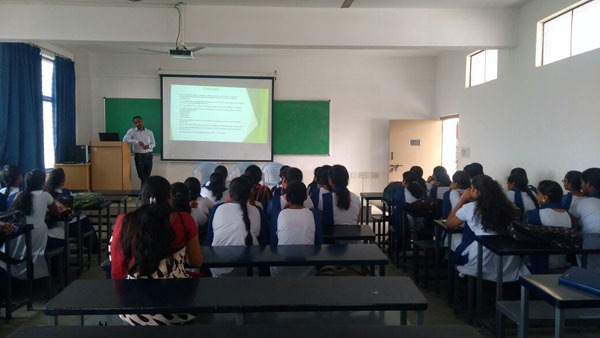 5 5 Days workshop on “NI USRP” Mr. Manimaran A, Assistant Manager, VI Solutions, Bengaluru, Organized to Both Faculties and Students 17th to 21th September 2018. 8th February 2018 to 10th February 2018. Activity: Won 1st place inpaper presentation entitled “Identification of Multiple Human in Videos”. Activity: Won Best paper “Wireless power transfer system. Activity: Won Best paper “A Therapy System for Articulation Disorder correction”. “A 2x2 MIMO Wireless communication system using NI USRP module. 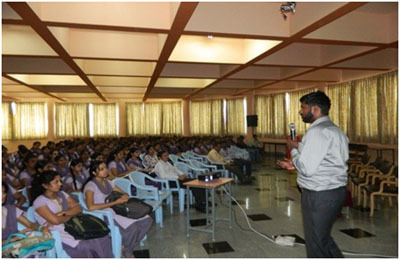 4 Attended an awareness camp on "Entrepreneurship"
Anupama S (4GW07EC010) secured 8th Rank in VTU Exams in the year 2011. * *Placement process is still ongoing .